The text of the agreement has been shrouded in secrecy. But we know from leaked documents that the TPP would let corporations monitor our online activities, cut off our Internet access, delete content and impose fines. This is why the Free Press Action Fund has joined with RootsAction to stop the TPP. 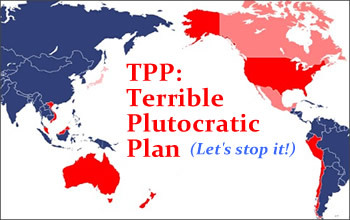 Sign our joint letter to Congress and the White House and tell them to reject the TPP. As a constituent, I urge you to make the text of the Trans-Pacific Partnership public and to block any proposal for fast-track authorization.